Pop songs can be powerful, and surprisingly so. There’s this song, “Unwritten,” by Natasha Beddingfield that will always remind me of the day Nora was born. I guess it was on the radio a lot that week, but I couldn’t get it out of my head. I heard it on the radio again this week, while driving Nora to daycare. Cheesy sentiments throughout the whole song, indeed, but it still touched a nerve with me way back when I was holding this tiny froggy newborn. I can’t help but be excited to watch her story unfold, and be a part of it. It also occurred to me that I don’t actually write anything down. But, are undocumented moments any less important to us? I like to think that we’ll still remember the stories I don’t write down, and the moments not caught on camera. I’m too busy taking it all in to let a camera get in the way. That said, I still have this blog. I intend to use it more. I got sick with strep throat at Disneyworld. I spent most of my time in our hotel room, and honestly it’s still all a blur. We had good times the first couple days, then I came down with a fever. It’s pretty upsetting for me, still, to talk about. I’m planning a do-over trip for next year. Details to come. We have a swing set! Hurrah for Walmart! Oh dear, the weather here has been dreadfully rainy and gloomy. Nora turned 2 in August, cause you know, that’s when her birthday is. We had a party in the back yard, with other toddlers and grown-ups, and cake and everything! And I have no conclusion. So… FIN. Springtime Already, originally uploaded by errolbert. Taken by Errol. We all really enjoyed the weather today. We even let the cats out in the yard with us. Sometimes winter just ends like a switch is flipped. Here we are planning a swing set all over again, and thinking about where to put a little pool. Tigger and Me, originally uploaded by MississippiAnna. Me, June 1986. 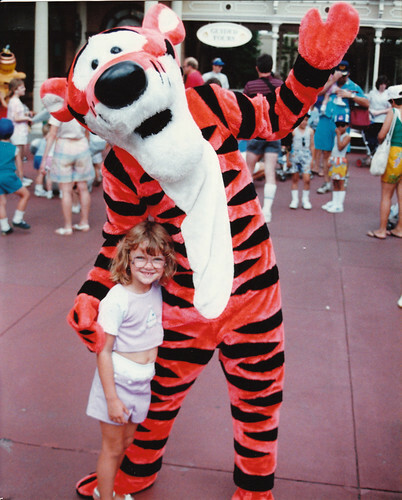 I have been to Disney 3 times since then, and always get another picture with Tigger. In 10 days, I’ll be back! We’re heading down to Disneyworld with my mom and Nora in tow this time. For a whole week! I’m SO looking forward to this vacation. So, let’s see. One month later. What happened in September? Not a whole heck of a lot, honestly. Nora is still not walking on her own. And, I’m OK with that. Number of football games attended: zero. Presidential debates: one. Errol was an IT volunteer for the debate commission the week of the debate. He was in their offices Monday through Thursday, then was sick and stayed home on Friday. He missed the big action, but still got a glimpse of the governor, and a “hello” from Jim Lehrer. You can see his behind the scenes photos here. >> Major swing set project in the works, stay tuned! Fall is my favorite time of year, and we still have a lot of mild days ahead of us. I have ambitions of spending those days in the backyard. >> Errol’s dad and stepmother will be here next weekend. They will be staying at a campground nearby, and we might try to camp out for a night with them. Nora got tubes on the 18th, and it went really well. She was already happy, and if you can believe it, she’s even happier. Her progress in learning to crawl picked up almost immediately, and now she gets around so fast it’s scary. So, childproofing: high on the to-do list. Although, we generally plan to take the approach of having her learn what’s ok and not ok to touch instead of removing all objects from everywhere and padding all walls and corners. We will try camping again. Perhaps not in such a hot time of year next time. Also, next time we plan to travel, I will have to put her down to sleep in a travel crib for a few nights before we leave. More than anything, not being in her crib seemed to throw her off. This baby is useless without naps and a good night of sleep. The theme of the past couple of months, for me, has been the struggle to balance work-life and mom-life. I’m still working half days, and it’s clear that, financially, I can’t do this long term. We plan for me to return to full time after the Labor Day holiday. On the one hand, it’s the safe and practical decision, but on the other… I am so dreading it. On a bright and happy note, our nieces are coming to visit next weekend! They are Errol’s step-brother’s two girls, ages 13 and 8. I think it’s something they’ve wanted to do for a long time. I have no idea why. Maybe they thing we’re cool or something? I don’t see it. Errol’s parents are bringing them and leaving them with us for the weekend. I’m pretty excited about planning girly-fun things to do, although with these two we’re probably just going to play a lot of Guitar Hero. My best friend just had a baby. I used to be jealous of her midwife, and her plans for a home birth. But, I can’t do that to her. I can’t be jealous. She had a very traumatic experience: 4 days of labor, and a 10 pound baby boy who wanted to come out elbows first. Now that I have had my own baby, I don’t believe anyone can have the perfect birth. There’s no way your expectations can match what it’s really like to have a baby. I want to be there to give her the support I had, and to be for her the help I wanted. Her experience brings back so many memories and raw emotions from after Nora was born. We had a really good talk, and a really good cry together last night. It was so good to have her on the phone. What can I gain from going for a visit? What can she gain, if I can only be there a couple of days? I want to give her confidence. One thing I can say about my doula, our pediatrician and the lactation consultant: I can look back on their words as encouraging and strengthening. Our pediatrician once said, when I was in the middle of heartbreaking breast feeding problems, was “You need to enjoy your baby.” And, I wasn’t. I want to help my friend have time to enjoy your baby. I know she is where I once was, and just maybe I can help her draw that map to joy.